amidst all of her instruments (piano, accordion, mandolin, fiddle, etc.) and huge scrapbooks full of family pictures, with radio and television programs blazing with rhetoric from conservative talk show hosts. Greeting us at the door every week, as we delivered her meals, took much effort, but Avonne always met us with a smile and a welcome into her home. Avonne loved company and loved to visit. However, Avonne’s visiting was not empty conversation. Avonne always shared her thoughts, opinions and intelligent ideas. Avonne was quite spirited and well-spoken when she discussed her beliefs and love of her family. Her entire family was musically inclined and she spoke often of their music nights at home, singing and playing instruments. I guess one of the reasons we became such good friends, is that I could always understand her and knew what a fine person she was, when many others could not readily understand her speech and perhaps, judged her too quickly, based solely on her disability-a visibly deformed spine. Bill and I found it difficult to shorten our visits with Avonne, as we loved her stories and fell in love with her sweet spirit! She adored her Buttons, an elderly Shitzu, and despite all of the challenges he presented her with, she loved him as her child! Buttons had a huge bin full of doggy toys, that squeaked, talked, etc., as well as every catalog doggy designer cloak available!! Buttons dined on people food, lovingly mixed with his dog food by his Mama, Avonne. Our relationship with Avonne grew over the next two years. As it became more and more difficult for Avonne to care for her own needs, we noticed that Buttons had become very ill, as well. A decision had to be made for Avonne to leave her home for a nursing and rehab. center, at which point, Bill and I took Buttons to our local veterinary clinic. Buttons was very ill, but following a few weeks of treatment, he regained his strength and acted more like his active, barking self. I took Buttons to visit Avonne on the north side of town, as often as my work schedule allowed. Avonne loved seeing Buttons and enjoyed introducing him to everyone at the center. All Avonne wanted was to be back in her home with Buttons. Eventually, she was moved to a care center close to our home, making Button visits more frequent. Avonne joined her family on August 28, 2012 and the graveside services were held in a small cemetery in Clyde, Texas. Those of us attending included her family’s preacher, Weldon, my husband Bill and me, the Diaz family who had cared for Avonne’s sisters in the past, Avonne’s friend Bobby and husband, a distant cousin Sharon and friend, and 3 out-of-town friend-previous neighbors of Avonne’s. Fifteen of us, a makeshift pulpit, and a small cd player—very simple—very sweet—very Avonne! I miss Avonne so much and think of her on a daily basis. Occasionally, Buttons stands by the door, looking up at me as if he has forgotten, we no longer make our visits. It is so very hard to let go of a friend you came to love. I am sure, Avonne is at peace, playing her accordion and piano, as her family plays fine music together! I will remember you, always. 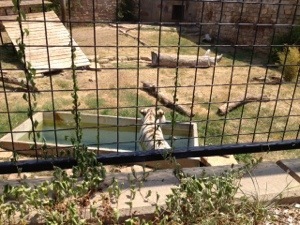 Bengal Tiger cooling off in his pool on a Sunday afternoon at the Abilene Zoo. This summer, I have experienced the pleasure of getting to know my neighbor Janice Nowakowski, who is so delightful, creative and described by me as a very fast thinker. 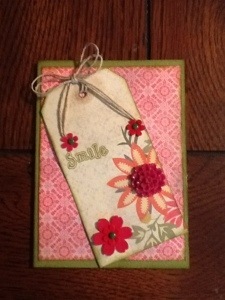 When you hang around with Janice, creative ideas seem to explode; just visiting with her is pure joy! She has opened up the world of antiques and refined junk to me. She inspires me to visit sites around Abilene searching for “good finds” with potential for greatness!! We have so much fun planning and discussing her latest projects. During one of our recent discussions, Janice peaked my interest in going to Baack’s florist to see its transformation, authored by Janice and another talented friend of mine, Cynthia Deegan. Visiting Baack’s, I fell in love with the bright-colored ceramic vases and candle holders, the oval grapevine baskets and of course, the gorgeous plants! 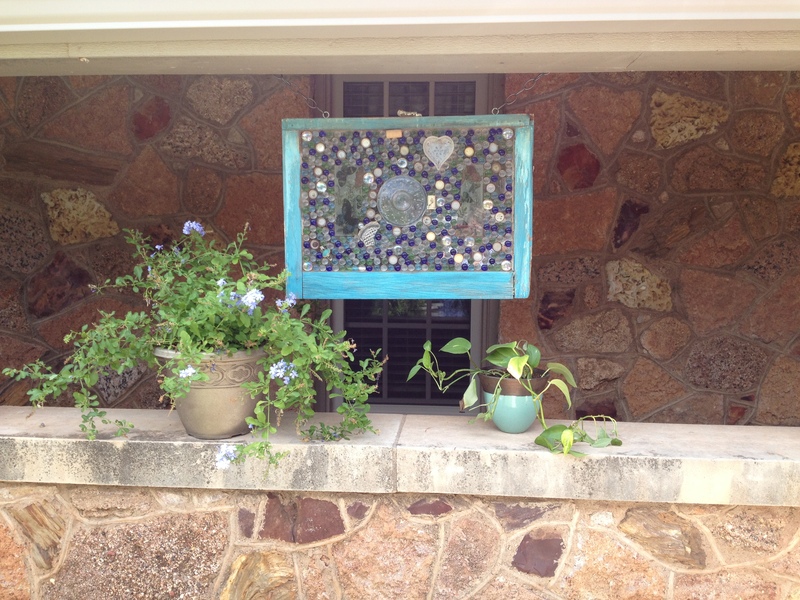 As I entered the plant room, my eye was immediately drawn to a beautiful sun catcher created by Janice, made from an old window frame, hanging amidst the butterfly plants. When I commented to Janice about how much I liked it, she told me to take it. 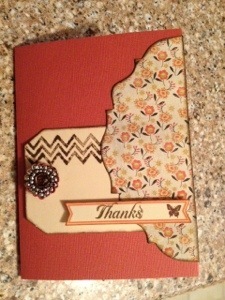 I was shocked, but also so appreciative of such a beautiful and creative gift from a friend whose talents I so admire!! BG and I immediately hung it in our walkway near Fee’s garden. Unique gifts created by friends are the best! After another visit with Janice, questioning where she comes across her “fabulous finds”, she expanded my decorating horizons by referring me to It’s About Time-a unique store in Abilene full of new discoveries! During my later visit to It’s About Time, I became acquainted with Pam Sumrall, a friend of Janice’s, who is also a design consultant for this amazing store. I felt like Pam and I had been friends all of our lives. She was so kind and helpful to me in acquiring a sense of my own preferences in design. She looked at design elements we were using in both rooms and encouraged me to think in different ways about those items. Pam helped me find the perfect color of khaki for our walls and taught me so much about decorating in my own unique style. Among Pam’s many suggestions: bringing elements of nature inside through use of a variety of textures (including textured fabrics, rocks (which I love), pillows, artwork, etc. ), adding hints of outdoor green, use of the wonderful khaki scarf as part of my new centerpiece, glass domes, feathers, bird nests, etc. Pam showed me how to use groups of books (something important to me), color, and groupings more effectively. We gathered several items from the store for me to take home on a trial basis-what fun–we will have a whole new look in a few months! I found Pam a delightful and fascinating person and look so forward to spending more time with her!